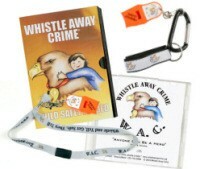 Our Whistle Away Crime® Fundraising Package is designed to raise funds for your group or organization. Everyone is concerned about safety. Just show the Adult Orientation Video to a group as large or as small as you wish and offer the Child Safety Video to your participants at our retail price or simply distribute our information and price list, collect and order.